When winter's chill makes you want to pull the blankets up close, blanket your home by winterizing it. But you don't need to lose the views from your screened porch. 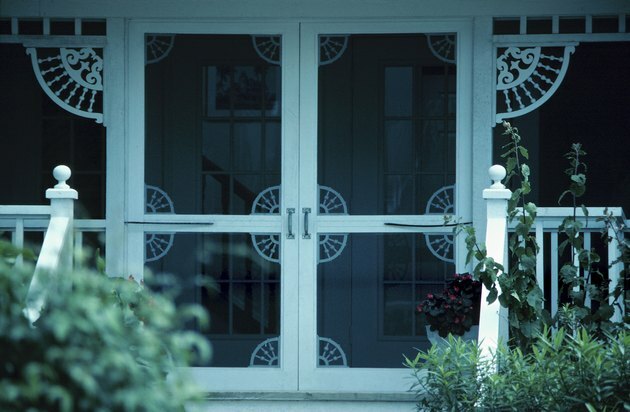 Protect your porch from winter chill without compromising your view by using thick, clear sheets of vinyl. Clear vinyl sheets can be easily attached to your screen porch in an afternoon and will start blocking the cold winds immediately. Measure the screen length and width with a measuring tape. You'll need to know how much vinyl to purchase and how wide the sheets should be. Vinyl sheets may come in 48-inch or 54-inch widths. Purchase thick, clear vinyl from a hardware store or home improvement center once you know how much you'll need. Cut the vinyl sheeting so that it's large enough to cover the screens on your porch while having a small overlap so it can attach to the wood framing the screens. Add 2 inches on each of the four sides to provide adequate room for installation, so a screen 36 by 60 inches would require a vinyl sheet measuring 40 by 64 inches. Cut all the screen panels you need with scissors. Use the measuring tape to mark dimensions. Cut a 12-inch section of Velcro tape for the top and bottom corners and one to two sections for the sides. Attach each vinyl covering with eight pieces of Velcro tape, or with six pieces of Velcro tape for short square-screen windows. Attach the Velcro tape to the vinyl along the corners. Cut equal lengths of vinyl tape for the porch and attach those to the siding on your porch. Stick the Velcro together so that the clear vinyl sheets cover your porch screens. Install all of the panels in this manner.